Screening louvres are generally used in locations where rain penetration is acceptable, or the location is sheltered from adverse weather conditions, as they generally offer a poor level of weather performance. 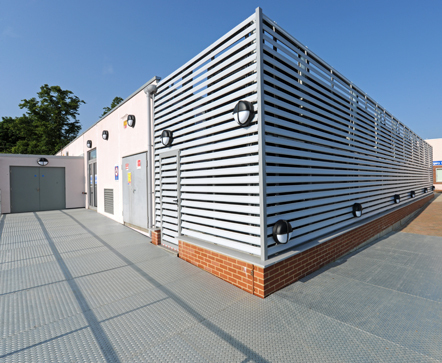 Often used on the top of buildings to conceal HVAC systems, screening louvres help to hide unsightly equipment whilst providing passage of air to plant machinery. For improved screening performance louvres can be installed upside down to better screen plant machinery when viewed from below. SLA screening louver is the ideal compromise for effective concealment and perfect aesthetics with many choices of blade shapes, finishes. The SLP plastic screening louvre is an economical solution, consisting of plastic blades and aluminium mullions. This system offers a clean and simple aesthetic.